It's hard to believe that the holidays will be here before you know it! Nothing gets me more in the holiday spirit than buying live holiday plants for my house and as hostess gifts. They are not only affordable, but they add that touch of instant style to my decor. 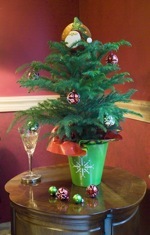 One of my favorites for the holidays is the Norfolk Island pine. These fully-decorated miniature evergreens from the South Pacific look great in holiday containers on a mantle, as a centerpiece in the middle of your dining table or in your kid's room. After the holidays, you just remove all the decorations and enjoy them year round. If you live in Zones 10-11 you can plant outdoors during the warmer months. Another must-have plant for the holidays is the Poinsettia, which comes in an array of beautiful colors and sizes. Displayed alone or in groups, they add a festive splash of color to every decor. They are so versatile that you never have to worry if the recipient already has one. Try them as a centerpiece on a holiday table or if you're in a warmer climate plant in your landscape or around your mailbox. These beauties can brighten any room and really make the perfect holiday gift for friends and family. I know I'll be spreading some holiday cheer with live plants this season! Will you? I want to start growing indoor plants that help to clean the air. Being a renter there are so many toxins that I am exposed to. The plants should help to brighten up the place and clean the air too.